EZkeys Retro Electrics includes two carefully captured and timeless electric pianos, the Clavinet D6 and the Pianet N, both from the classic German manufacturer Hohner. These two instruments are world-famous for their distinct sound and have been perpetuated in numerous hits from the golden ages of funk, soul and British Invasion. 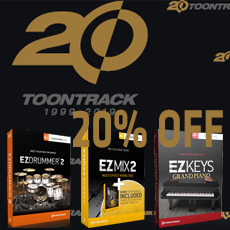 If you have registered at least one EZkeys Instrument already, you are eligible for the reduced "EZkeys Sound Expansion" to get the Retro Electrics and save big! Even though production has stopped long ago, the complex and round sound of the Pianet and the bright staccato of the Clavinet keep resonating vividly in all corners of contemporary music production, making these Hohner classics every bit as relevant in any songwriters toolbox today as they were back when it all started. Customers that already own one EZkeys can go straight for any other and get a discounted price on the EZkeys SoundExpansion. All your EZkeys sound libraries will be accessible through the same instance of EZkeys. I will have to experiemnt more with it. The sound is ok, but I'm still to be more impressed. A bit deceived by the fact that I was not able to have the extra bank when buying this lib, which was at a fair price though. Great EZ Keys product.As expected.